The girls had a drama-free morning getting ready and setting out for school. 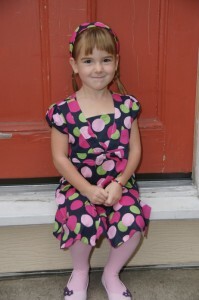 J is familiar with her 1st grade teacher (M had her), and her BFF is in her class, so she wasn’t nervous at all. She’s been practicing her reading, so I think that she’ll just blossom into someone who can read easily for fun very soon. Last night, M finally admitted that she was excited about 4th grade. “Our whole group of friends hasn’t been together in so long. I’ve seen people here and there, but I’m looking forward to seeing everyone at the same time,” she said. I’m happy with her friends, too. She’s navigated around some mean girl social pitfalls already, and I like the current friends. I’m not worried about the academics for her, so we’re golden. I hope. One thing that drives me crazy about the first day of school? Their outfits. My kids always look cute. . . but with at least one fashion don’t. It happened this morning, too. M wore her stripey sweater, buttoned up the entire way. That’s not a flattering choice on anyone, really. J was wearing an adorable little flowered shirt, then topped it with a striped hand-me-down sweater that’s seen better days. Especially annoying when the raincoat that she owns would have matched perfectly. And yes, it was raining. I almost never insist on anything, clothing-wise. I would only insist on a raincoat or umbrella if it were pouring, and then they would have already chosen them, anyway. I’ve been known, in cold weather, to tell the kids, “You don’t have to wear your coat, but if you’re not going to wear it, you’ll have to carry it or people will think I’m a bad mom.” Something I do insist on is a minimum of a shirt and underwear at the dinner table. I have my standards, after all. No: you won’t see my children wearing the most optimally parent-pleasing outfits. 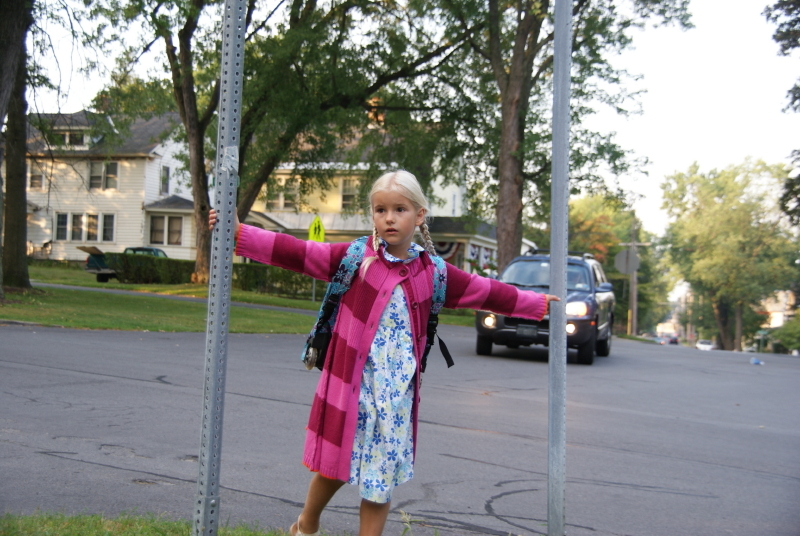 When they were in nursery school, I often felt wistful when I’d see some girl in a fabulous get-up and the mom would say, “She doesn’t care what she wears.” J spent two months of nursery school alternating between two different pairs of footy pajamas. I am so not kidding: friends still talk about it. For the first day of school today, as always, they choose what makes them feel fabulous. And usually, their choices wouldn’t be mine. 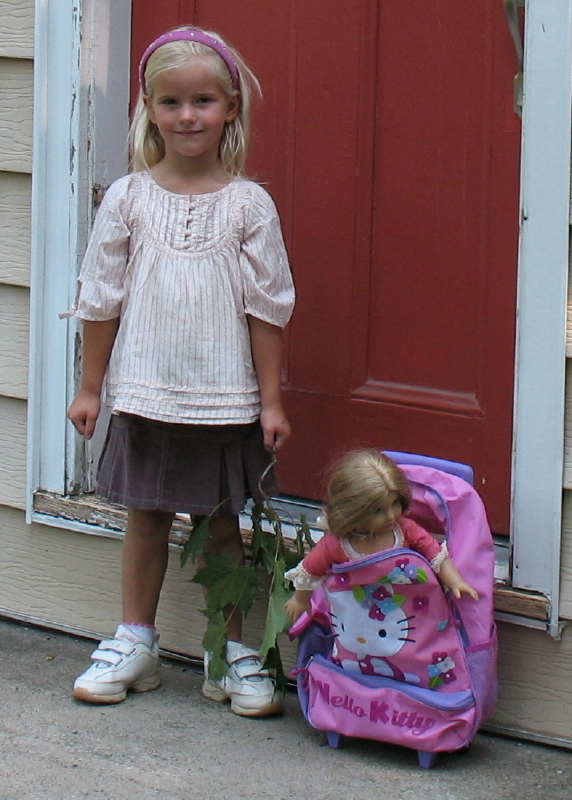 But a funny thing happened today, when I poked around in my digital trove of first-day-of-school pictures. Even though I recognize and remember what I hated about each outfit, there is no denying the pictures. These girls were adorable, confident, and happy. M heading to kindergarten. We owned cute little shoes that she didn’t want to wear. Also the headband, pinkish-purple with rhinestones, clashed both color-wise and style-wish with the peasant blouse. 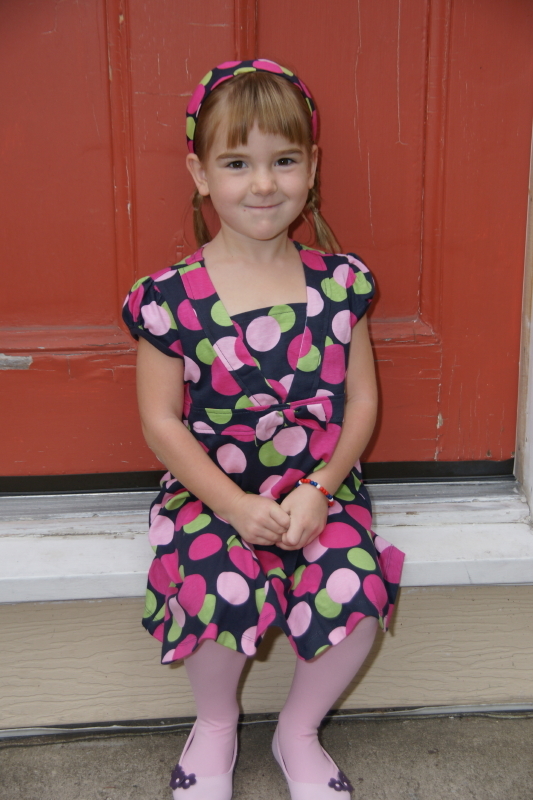 For 1st grade, J had chosen an incredibly coordinated outfit. My hopes were high until she gave herself a new bangs haircut. Throw on a clashing bracelet, and she’s ready to go. Here’s the beginning of one of M’s enduring favorite fashion choices: the long sweater. Both her sweet sundress and the stripey sweater were cute, but together? Oh, my gosh, this made me crazy that morning. 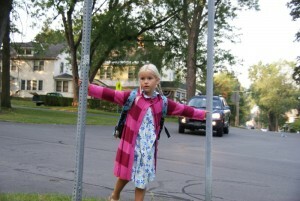 And now I look back at the pictures and she looks like she could be a model in a catalog. I have a bunch of photos that are even more flattering, but this one showed the outfit better. And so they left this morning, again: adorable, confident, and happy. And it’s out of my hands now. For the next few hours, I’ll just have to hope that the rest of the world doesn’t mess that up. Loved those footie PJ’s of J’s. I hope the girls loved their 1st day! Yeah, I had to save the pjs. Happy first day to you and yours, too.